Hip arthroscopy is a sophisticated medical procedure that can treat a wide range of hip issues. Arthroscopy is an advanced procedure used to diagnose and treat conditions afflicting the joints of the hip. It uses a tiny, specialized camera that produces real-time diagnostic imagery of the joint. The camera is inserted through a small surgical incision of about a centimeter. Surgical tools are inserted in similar incisions nearby so the doctor can operate based on the camera’s findings. What is Hip Arthroscopy Used to Treat? The hip labrum is a cuff of thick tissue directly surrounding the hip socket. It helps support the hip joint, enhancing its motion and reducing friction. When a labral tear takes place, it can cause a piece of tissue to become snagged in the joint. This creates pain and a “catching” feeling. Loose bodies are pieces of cartilage that form directly within the joint itself, inhibiting its ability to move normally. On an arthroscopy camera, they appear as small spheres of material floating in the joint space. Removing them prevents them from “catching” as the hip moves. Snapping hip syndrome is a catch-all term for a problem that may start in several ways. Whatever the case, it is noticeable due to a persistent catching sensation in the hip not attributable to known causes. During arthroscopy, a tendon release can be used to ease internal snapping. Cartilage is soft, flexible connective tissue found in many places throughout the body. When the patient has localized cartilage damage around the hip, arthroscopy can remove loose cartilage that broke away from the trauma point and infiltrated the joint. What is Recovery from Hip Arthroscopy Like? Recovery from hip arthroscopy is usually uneventful. In fact, less than 10% of patients report any significant side effects. Minor nerve irritation is not unheard of, but is usually minor and stops on its own within a relatively short time. This typically presents as tingling or numbness in a limited area around the thigh and resolves itself within about six months. Significant complications occur in less than 1% of hip arthroscopy patients. The exact amount of time it takes to completely recover from surgery varies from person to person. Factors such as age, bone density, and overall health, all play a role. It is important to follow your doctor’s instructions for post-surgical care to reduce the odds of future concerns. 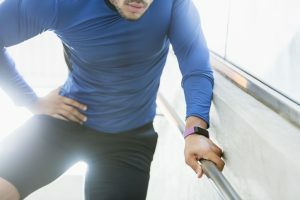 To get the best results possible from a hip arthroscopy procedure, it’s essential to choose an expert physician with specialized training with this technique. Dr. M. Tyrrell Burrus, MD, is a leader in hip arthroscopy with offices throughout the Austin area.